Introduce more multilingual liturgical music into your liturgies with music in Filipino, English, Mandarin Chinese, Spanish and Latin. This 14-song MP3 Album by Ricky Manalo, CSP features multilingual liturgical music, including songs with verses in Filipino, English, Mandarin, Chinese, Spanish and Latin. This groundbreaking collection introduces the rest of the world to what many have known all along: the Filipino Catholic community has a long and rich tradition of liturgical music. Recorded in the Philippines using traditional and contemporary instruments, the CD includes some of the most popular liturgical songs used in the Philippines today. 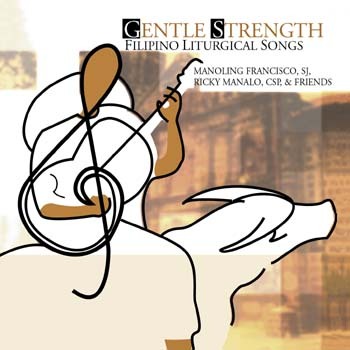 Created with the intention of introducing more multilingual liturgical music into the sung repertoire of worshiping communities, Gentle Strength offers songs with verses in Filipino, English, Mandarin Chinese, Spanish and Latin. Though most of the 14 songs are multilingual, four are sung entirely in Filipino and two entirely in English. Inspiring, meditative and buoyant, these are songs that reveal the beauty, heart and prayerful tradition of Filipino Catholic culture. Produced by well-known composer and Paulist Father Ricky Manalo and Jesuit Father Manuel Francisco, this collection includes music suitable for a variety of seasons and occasions, including occasions when the Filipino community gathers separately as well as timesx when the larger parish community wants to celebrate the presence and gifts of the Filipino community. Arranged for solo voice, choir, guitar, keyboard, violin, flute, percussion and banduria (a traditional Filipino string instrument similar to a mandolin), the octavo packet gives your musicians the tools they need to bring this wonderful music to life.